Summer is the perfect time for a picnic! It’s also the perfect time for wine. Why not combine the two for a wonderful afternoon of fun? Just pack your picnic basket and head to any of these wineries (or others in the state). 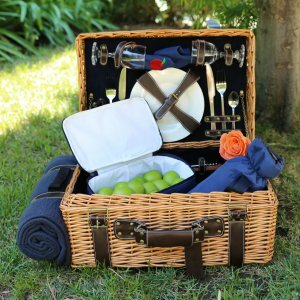 Here are some of our suggestions (in no particular order) for great wine and picnic adventures. Baker Buffalo Creek is located in Lawndale, NC just northwest of Shelby in Cleveland County. An old dairy farm that’s now a vineyard. Its red barn has been featured in in a couple Hillshire Farms commercials. Picnic in the sun, under a shade tree or underneath the covered porch or milk barn. For wine, we recommend the Barrel-Aged Chardonnnay! It’s always a crowd-pleaser. Silver Fork sits near the South Mountains in Burke County. The view is stellar any time of year. Also, you don’t even have to pack a picnic here. Enjoy the fantastic food from Farm to Fork Eatery. You won’t be disappointed. For wine, we recommend the Chardonnay which comes from some of the oldest Chardonnay vines in the state! Roaring River sits right on the Roaring River not far from Stone Mountain State Park. If you’re looking for a serene getaway, this is for you. Sit on the deck by the river and listen to the water flow. And don’t worry about being interrupted by a phone call. Your cell phone probably won’t work here. As an added bonus, food is available from their onsite restaurant, so “picnic” while enjoying full service. We recommend the Viognier for your wine choice! Parker-Binns is located in Polk County between Forest City and Hendersonville and not far from Lake Lure. Enjoy views of the vineyard and surrounding mountains. If you come on Sundays, enjoy free wood fired pizza from the oven. There’s often live music too. And say cheese, as you’re bound to get your photo taken for sharing on Parker-Binns Facebook page. We recommend the Rosé which will pair with anything you’re eating! Hanover Park is the oldest winery in Yadkin County and oldest continuously operated winery in the Yadkin Valley. Enjoy a picnic out in the sun or under one of the large, old shade trees near the over 100 year old farmhouse which serves as the tasting room. We recommend the Viognier. It goes perfectly with a warm summer day. Davesté Vineyards is located in Troutman, NC near Lake Norman. Picnic underneath the trees or under the covered pavilion. Live music is often featured. There’s also Davesté beer for those who prefer beer to wine. For the wine choice, we recommend the Rkatsiteli! Davesté is the only winery in North Carolina which produces an estate Rkatsiteli. What are your favorite wine and picnic spots? Leave us a comment or share with us on social media. And on social media, don’t forget #NCWine!